LiveScribe has long been loved by Dan and Michael. I finally took the leap last year buying the LiveScribe Sky, as I needed a way to take notes during conference calls. 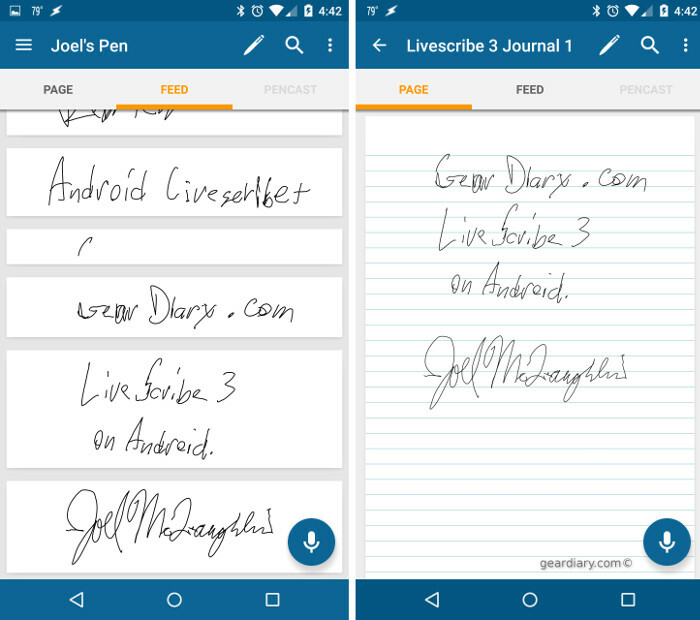 I recently upgraded to the LiveScribe 3, as it now supports Android. While the support and basic functionality are there, I am a bit underwhelmed with the app. The basics are all there in the app. It records my pen strokes as it should and is fairly accurate most of the time. You can easily convert pen strokes to text in the app just as you can with the iOS app. You can also record pencasts with audio, just like the iOS app. However, it’s the little things that are missing that irk me. For example, the Sky automatically uploaded everything to Evernote which was very handy. The Android app cannot autosend to Evernote or OneNote, however you can use the built-in sharing functionality on Android to share to Evernote, OneNote or any number of apps including Facebook. So that’s handy and an improvement in functionality over the Sky. Also, pin numbers are not supported yet in the app so if you have this enabled in iOS, disable it before you use your pen with an Android device. Also the tagging and collections controls on the paper are not supported in Android yet. LiveScribe will likely add this functionality later but I am not holding my breath. The notebooks that came with my Sky had icons for sharing to Facebook and other places but that functionality never came to be and if you tap the Sky on the icons it says they aren’t supported. So I am not holing my breath on this coming to Android. While the app needs some work to bring it to parity with the iOS app, it does work and it serves the purpose I needed: To electronically capture my notes. Also, while the autosend is a wanted feature, at least I have the ability to share my pages with ANY app I want. So I don’t have to use Evernote. 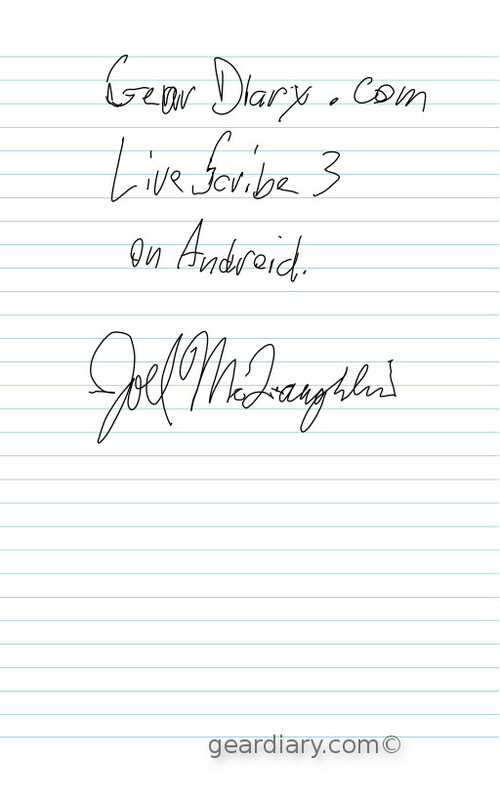 I can use Google Drive or any other app that supports Android’s built-in functionality and that I love. It’s nice to write a note with the pen and send it via e-mail. Other functionality I would like is the ability to choose more than one place to auto send notes at the same time. For example, I think it would be great to have my notes in Evernote AND OneNote. Not one or the other. I also look forward to being able to tag things with the pen as it will help keep things organized. I love the new form factor used on the 3 as it feels more like a pen. If you decide to get one, then I would also spring for the pro version as it also includes a nice portfolio and a hard cover notebook which reminds me of Moleskine notebook. My only quibbles are the stylus cap over the USB port is easy to lose, and occasionally it will really mess up the capture. Usually I cure this by taking the ink cartridge out and reinsert it making sure it’s all the way back. Not sure why it works that way but it does. LiveScribe’s products are awesome. I can’t wait to see what they add to the Android app and look forward to future iterations of the product. 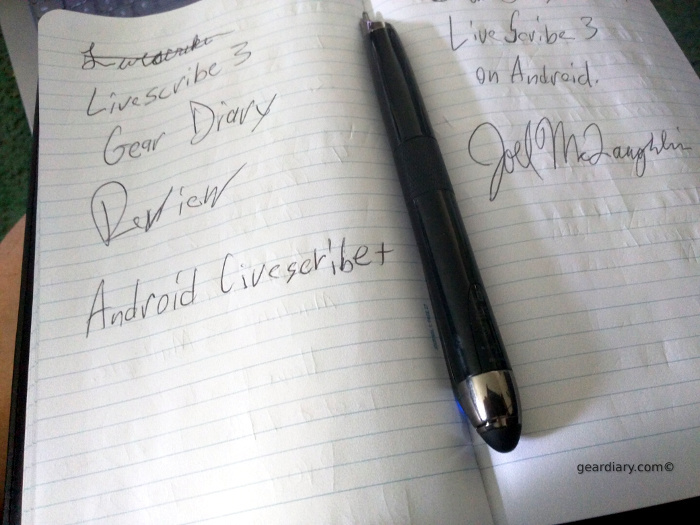 I find the LiveScribe 3 is an indispensable tool in my everyday work.